Specialty Pulp And Paper Chemicals Market size was USD 20.2 billion in 2015 and is forecast to witness gains by CAGR of 4.9%. Growing demand for one-sided specialty (coated) papers is likely to be the major driver for growth. One-sided specialty (coated) papers, manufactured from specialty chemicals such as functional and process chemicals, find product in labeling, release liners, envelopes, laminating, gift wrapping, posters, and thermal transfers among several others. In terms of volume, global market size for one-sided specialty (coated) papers was more than 4,000 kilo tons in 2015 and is expected to cross 5,000 kilo tons in the next three years. More than one-third of the global consumption of these specialty papers was for labels which are finding increasing usage in industries as well as stationery purposes. These papers also have a huge demand for flexible packaging in the packaging industry. The use of these chemicals such as defoamers, retention aids, flocculant polymers, and others in cleaning waste water before disposal and reducing the biological oxygen demand, by helping in recycling of fibers coagulated in primary clarification stages, is also expected to promote its global use, and enhance its market demand. Hence, the improved process efficiency due to its use is also anticipated to drive the global Specialty Pulp and Paper Chemicals market in the forecast timespan. However, environmental impact due to paper and pulp industry owing to the large amount of water, chemical and energy used for the manufacturing process would act as a restraint in the global market. Production of greenhouse gases like methane from waste papers is a major concern for the EPA. FDA regulations about the usage of bisphenol A in the production of thermal papers due to its effect on human endocrine system is also expected to hinder the market growth in the forecast period. Specialty pulp and paper chemicals market size is split by four product segments which include bleaching, process, functional, and basic chemicals. Of these, functional chemicals had almost half of the total specialty pulp and paper chemicals market share in 2015. Functional chemicals include dyes, pigments, and coating chemicals. Rising demand of value-added paper resulted in the highest consumption of functional chemicals in 2015. Functional chemicals are forecast to have the fastest growth at over 4.5% CAGR in terms of revenue from 2016 to 2024. Bleaching and process chemicals together recorded over 45% of the total market demand in the same year. They are expected to lose their market share to functional chemicals in the forecast timeframe. The rising demand for recycled papers owing to increasing awareness about environmental conservation will drive the demand for bleaching chemicals. Global recycled paper consumption was recorded at more than 200 million tons in 2015. Bleaching chemicals may register a revenue growth at a CAGR over 4% from 2016 to 2024. Process chemicals include chelating agents which help in removing scales from pulp manufacturing machines, thus improving their efficiency and extending their life span. This product segment is expected to cross the revenue of USD 6,700 million by 2024. Basic chemicals such as caustic soda and other mineral acids are used to increase the pH and help in easy breakage of fibers. They constitute less than 2% of the global market share. Asia Pacific, led by China specialty pulp and paper chemicals market size, dominated revenue landscape in 2015 accounting to over 35% of the total volume. It is expected to have a steady growth throughout the forecast timeframe. With an increase in the production capacity in the region, Asia Pacific is forecast to be the fastest growing region in Specialty Pulp and Paper Chemicals market at close to 6% CAGR from 2016 to 2024. Growing demand of packaging materials on the account of steady growth in retail market of China and India will influence the global rise in specialty pulp and paper chemicals demand. Europe specialty pulp and paper chemicals market share in 2015 was close to 30% of global demand; however, will reduce as paper consumption trends move towards APAC. North America will also be affected with the advent of the digital age. With rise in advanced electronic media the demand for paper media for magazines will find a decline in the next eight years. However, the increasing use of specialty papers for packaging will drive the growth for specialty pulp and paper chemicals from 2016 to 2024. North America and Europe are expected to have growth at CAGR of over 4% in terms of revenue in the forecast timeframe. Latin America (LATAM) will find a significant market because of new manufacturing facilities coming up in the area. The LATAM market is anticipated to cross USD 3,300 million by 2024 growing at a CAGR above 5% from 2016 to 2024. Specialty pulp and paper chemicals market share is consolidated with leading six market players having more than 75% of the global market share. Kemira Oyj, AkzoNobel N.V., BASF SE, Dow Chemical Company, Nalco Holdings, and Ashland, Inc. are the major manufacturers in the industry. Other market participants include Shell Chemicals, SNF Floerger, Buckman Laboratories International, Inc. Evonik Industries, and several others. Kemira Oyj was the leading Specialty Pulp and Paper Chemicals company on a global level in 2015. The company has been extensively engaged in several facility expansion activities in order to increase its output and thus strengthening its hold in the market. 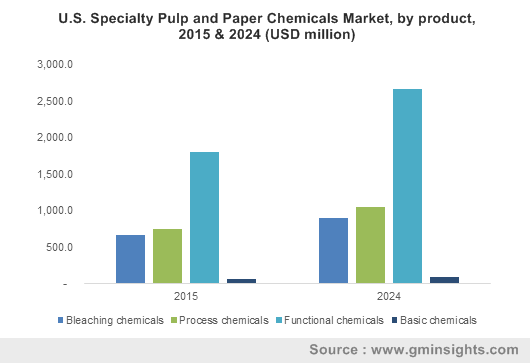 Growing demand for tissues, diazo paper, graphic papers, and other specialty papers is expected to be one of the principal factors influencing the Specialty Pulp and Paper Chemicals market. Additionally, the use of these papers in large quantities in primary, secondary, and tertiary packaging of several perishable and non-perishable goods. The growth of the packaging industry because of the growing e-commerce market is expected to further augment the growth of specialty chemicals in the production of specialty papers. Regular innovations by the market players in order to meet stringent environmental regulations and the growing encouragement for reusing of paper products will propel the specialty pulp and paper chemicals market. Development of new enzymes to make the paper production process more efficient will also boost the growth in the near future.